Seattle and King County friends, neighbors and family, the City of Seattle and Fox Plumbing & Heating wants you to know all about your side sewer. What is the Side Sewer? Seattle Utilities runs pipes down each street and past each house. There are pipes that bring water in and sewer systems that carry the wastewater away. The portion of sewer pipe that connects to your plumbing and runs alongside your house (hence the name “side sewer”) to the street is on your property. The city makes a big deal about informing homeowners that this side sewer is your legal responsibility. Why is this important? The most likely cause of a sewer back up that affects your property is your side sewer, (more on that below). 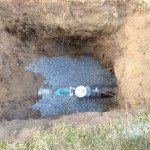 When a sewer backup or a pipe break occurs there can be expensive repairs and clean up. Because both city and private components make up the sewer system, it’s important to determine where the problem came from and who is liable for the costs. There are many things that can go wrong with a side sewer. Fox Plumbing & Heating’s plumbing professionals work on sewer maintenance and repair every day, so we asked them for previous side sewer issues they encounter. Pipe Fractures, Cracks, and Degradation: A common issue is the erosion of the pipe material from within. Cement pipes erode and degrade over time as do the tar-paper based pipes which were common during and after WWII. These pipes weaken, leading to fractures, cracks and an easy entry for the sewer pipe’s greatest nemesis – the tree root. Trees love the amazing source of water we provide them in our pipes, and they are amazingly strong. Even a new pipe can suffer from tree root penetration that crushes and blocks the flow. These issues can lead eventually to pipe collapse and failure. It’s a good idea to know where your sewer pipes are before planting trees in your yard. 2. Shifting Soils Create Sags: The side sewer is on a slight slope to ensure gravity delivers your wastewater to the street’s main sewer. With our rainfall and the soil structure of the Seattle area, it’s common for the ground to shift slightly. House foundations “settle,” and so might your sewer pipe. However, all leaks do start from poor installations to gaps or openings during the install process. That is why it’s so important to have a licensed Journeyman install your sewer. This can lead to a dip below the slope needed. All it takes is one section of lower pipe to inhibit wastewater delivery and clog up, causing a backup of sewage. 3. 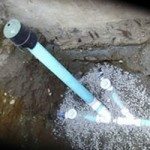 Holes or Uneven Connections between Pipe Segments: Your side sewer is not one long pipe, it is made up of several sewer pipe segments that have been connected at joints. Similar to holes in the pipe, seams that have tiny gaps or are offset can trap waste and/or allow dirt from outside to get in, creating clogs. Once soil moves in, it leaves a void or loose area on the outside which can be even more prone to shifting and create sink holes. 4. Debris Doesn’t Belong in the Sewer: Debris often accumulates leading to clogs and backups. This includes grease, oil, fats, baby wipes, feminine hygiene products and wax. These will clog up the pipes inside your house as well. Having routine drain cleaning including the main line can keep these to a minimum. Fox Plumbing & Heating and Seattle Utilities recommend starting with a camera inspection of your side sewer pipes. This is done by a licensed plumber who uses a probe attached to a video camera to peer into the pipes. The camera inspection can check for interior damage and clogs, and your neighborhood professional plumber will also look for visible external issues. Repairs to your pipes might be needed and how or what is done will depend on the individual situation. 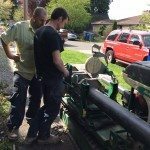 Fox Plumbing & Heating serves Seattle and King County with expert plumbing services including inspection and repair of side sewers. With their experience and equipment, Fox Plumbing can provide a variety of options for cost efficient sewer repair and maintenance. To get started with your side sewer inspection, contact us.